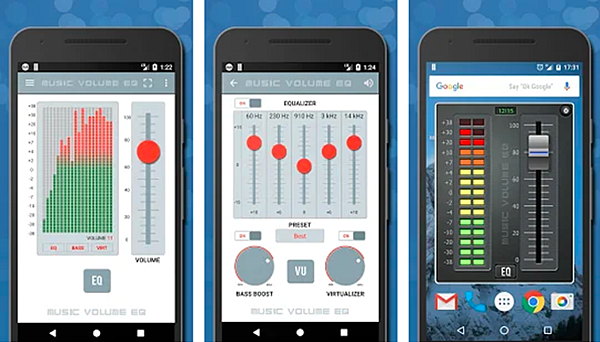 If you’re an Android User and audiophile, you may find that your ROM’s stock equalization and normalization tools aren’t good enough to listen to the musics downloaded from Pandora or other online or offline musics. You might have a really good music player but the only thing it’s missing is a proper bass booster. You might also want to normalize your sounds across the board because the loudness of each track or album isn’t the same. This list will give you eight Android applications to help you fully actualize the sound coming out of your Android device. Equalizer FX gives the user a clean, clear interface. Because of its simple user interface design, it has a low learning curve. The application is divided into three main sections: Equalizer, Effects and Profiles. It also comes with a widget which makes it easier for users to configure sound on the fly. It turns on and off automatically as soon as the music starts or stops respectively. The application is not limited to just music players, it also works with a plethora of streaming and radio services. It comes with 12 presets but it also allows you to create your own. On top of all of this, it offers you standard features like equalization, bass boosting, sound virtualization and loudness enhancement. I highly recommend you to download this bass booster equalizer app for Android. 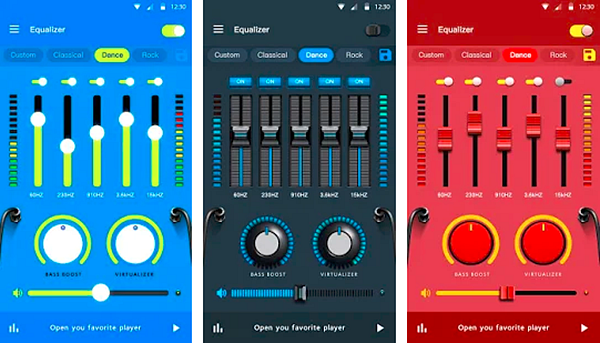 Equalizer and Bass Booster is one of the most popular equalizer apps out right now. With a Google rating of 4.5 stars and over 300000 downloads, it’s not hard to see why it found its way on this list. It has an interactive near 3D user interface with a material design. However the app isn’t just a pretty face. It offers users a five band equalizer, bass boost effects, virtualization, stereo LED UV meter and 10 equalizer presets. Equalizer- Bass Boost is another application with a very simple name that tells you exactly what it does. It has a simple yet aesthetically pleasing interface. It’s very easy to use. It comes with ten presets but you are not limited to them. You can edit or delete these presets as well as create your own. It comes with a five band equalizer, bass booster, loudness enhancer, visualizer effect, virtualization and a switch that allows you to enable disable sound effects. It offers all of this and it is completely free and that is why Equalizer – Bass Boost is worth the download. 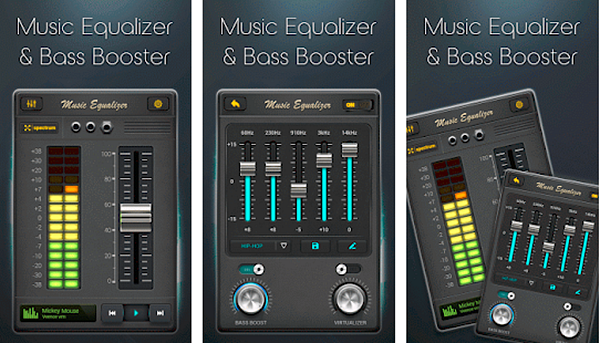 Equalizer Music Bass Boost gives the users a material interactive design. Using this application makes you feel like a real life Sound Engineer with its slides, nobs and LEDs. It comes with a five band equalizer, bass booster and a volume noise enhancer. It provides you with ten presets that all go according to genre. You can set your own custom presets as well. It also comes with a useful music player control where you can pause, play, fast forward, skip your music. Music Volume EQ gives you a live 3D virtualizer, which is something that most music equalization and bass booster apps don’t offer. On top of providing a clean but very interactive user interface, it also allows users to choose between two themes; classic and material. It has media audio control and five band equalization. It also offers a stereo UV led meter that can be viewed from its home screen widget. The application endeavours to give users not just an experience in sound but a visual one too. To achieve this, it also comes with live wallpapers. 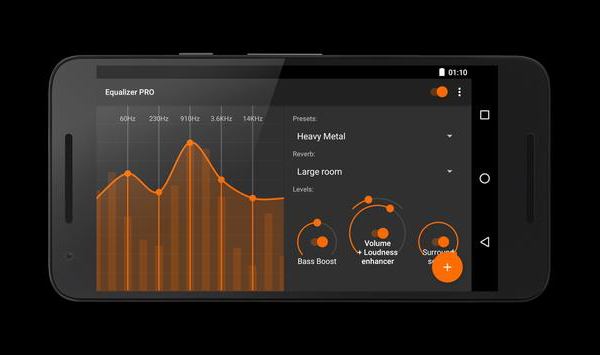 On top of that, it’s free and that’s why this bass booster app deserves your attention. 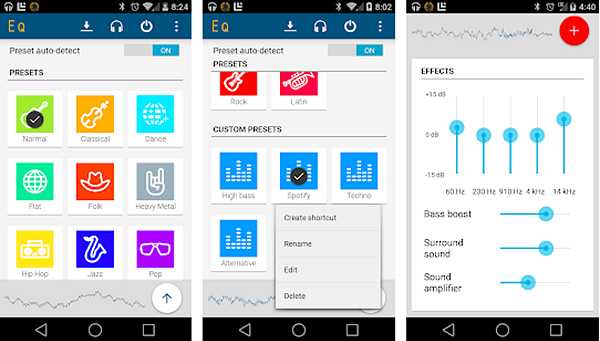 Equalizer is another equalizer and bass booster Android application with a very simple name. It comes with a home widget that is theme-able which mean you can download skins for it. In terms of the interface, the application finds a balance between material and simple. It comes with eleven stock presets, notification shortcuts, a bass booster and a virtualizer. It integrates with your stock music play but it also supports streaming services like Pandora and Spotify. Not only does it come with equalization presets, it also comes with reverb presets. You can also add your own custom presets. 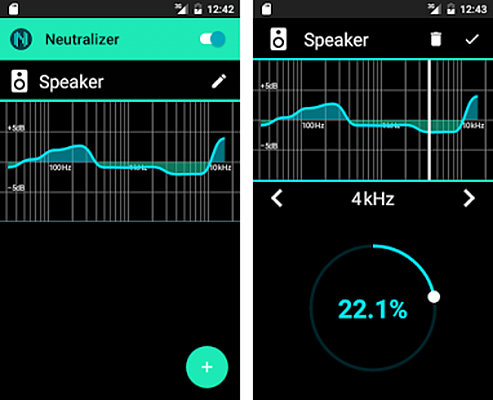 Neutralizer is an application whose niche is sound restoration as opposed to sound distortion. The wavy user interface may be off-putting for some people but it’s extremely easy to use. Its main focus is on sound equalization and clarity. It isn’t an equalizer in a traditional sense but it allows you to fine tune the audio of your speaker so it can match your needs. A great app for those who are hearing impaired. It works best on full band width speakers and headphones. For those of you concerned with your hearing. This application is a must to iron out any distortions in audio. Music Equalizer – Bass Booster & Volume Booster comes with 15 themes in colourful material designs. It also comes with a base booster that’s suited for your headphones and speakers. It has normalization, stereo surround sound effects and a 5 band equalization tool. The equalizer also comes with ten presets. It’s a simple but effective application. Note: Please be aware of the malicious apps available on the internet and never download any app from unknown sources. If your phone has been attacked by virus, you have to hurry to find an Android Data Recovery software to recover deleted data from Android phone after virus attack. 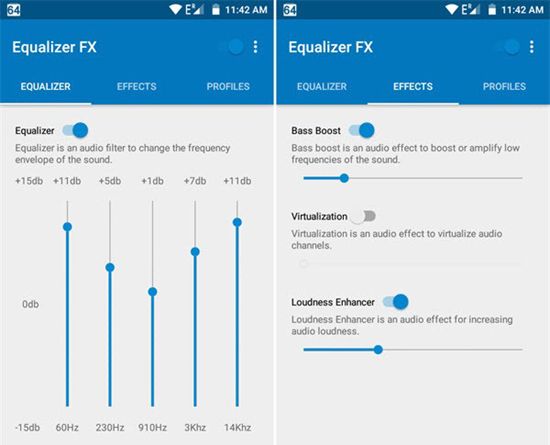 With this list of the best equalizer and bass booster apps for Android, you should be able to find the app that suits your needs. If you have any suggestions or want to point out any blind spots on my side, do not hesitate to comment below.